raising ebenezers: Saint Patrick's Day! One of the fun things about moving to a new place is figuring out how to celebrate your culture and traditions in that new place. This year was my third Saint Patrick's Day in Czech and the Yorman family and Evans family came over to my flat to eat Irish Food (deconstructed shepherd's pie.. because when I first moved here my oven didn't work and so began another tradition). The Yormans have been coming over every year and each time another few people join us - usually visiting guests. 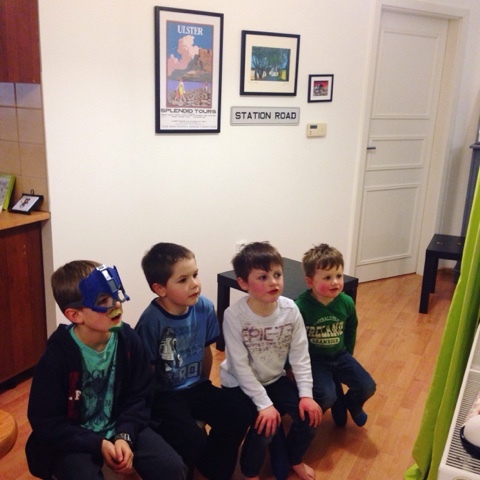 It was really fun to have my home full and watch the VeggieTales Saint Patrick's Day video with everyone. Saint Patrick was an incredible man and it's great to have an excuse to celebrate where I'm from with great people!